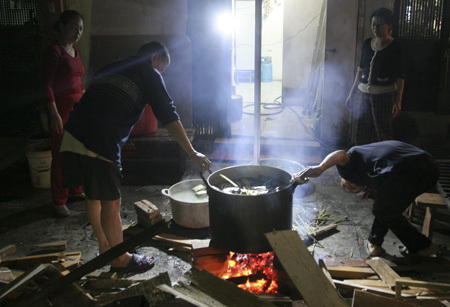 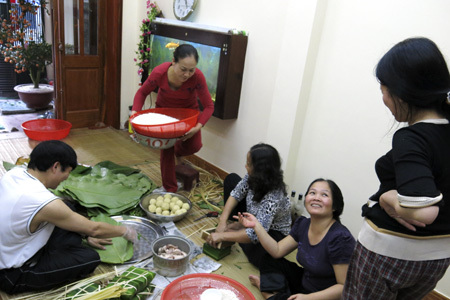 Making glutinous rice cakes or Chung cake is a traditionally indispensable in the preparation for Tet in Vietnam. 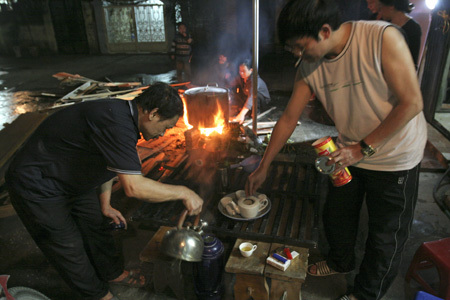 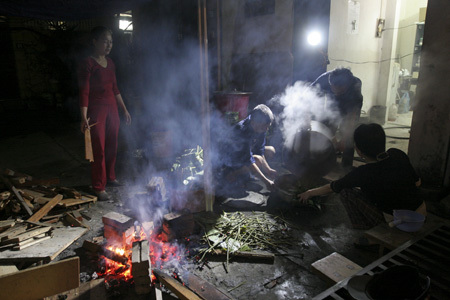 This activity also helps to warm up relationships with family and neighbours when people gather to make Chung cake for Tet, after busy working days of the modern life. 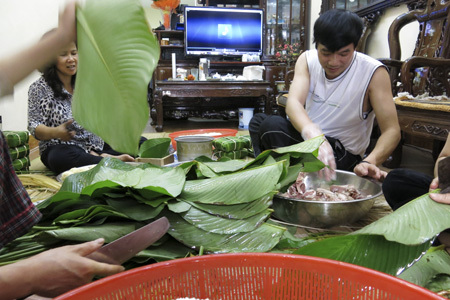 Nowadays, many families opt to buy Chung cake, as they lack of time to make it, while others, even in cities insist on making their own. 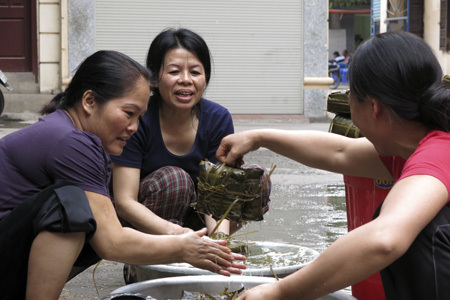 According to the legend, Chung cake was first made by Prince Lang Lieu, a son of Hung King, who is said to have worn the crown some 3,000 to 4,000 years ago. 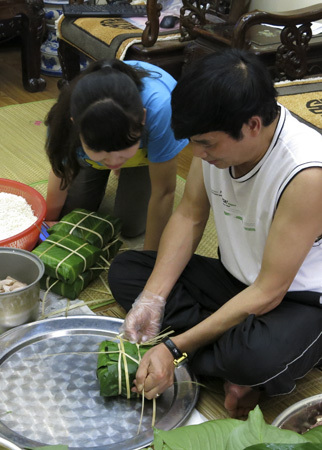 The prince made Chung cakes in square shape and Day cakes in round shape to symbolise the earth and the sky respectively, and offered them to the king to express his respect and gratitude for parents, as well as to thank the Gods for the year's good harvest. 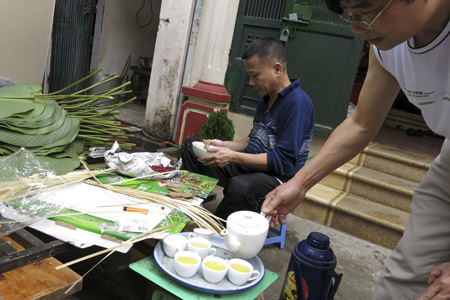 The tradition has been well preserved by the Vietnamese people nationwide although the way they make the cakes differs depending on region. 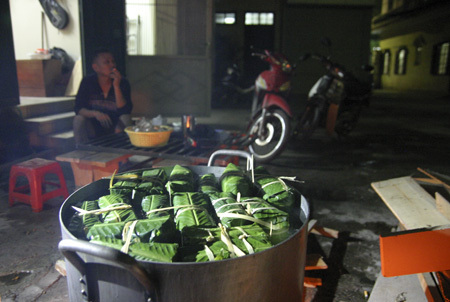 Northern Vietnamese make the Chung cake in square shape, while the southerners or ethnic people in mountainous areas wrap the cakes in a round shape. 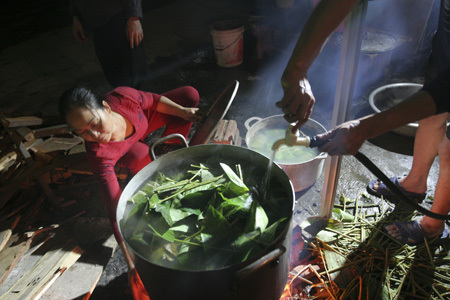 Making Chung cake requires simple materials and ingredients which can be found in every market in Vietnam: glutinous rice, green bean, fatty pork spiced with salt, onion, and pepper, which are all wrapped in phrynium leaves before being boiled for at least 10 hours. 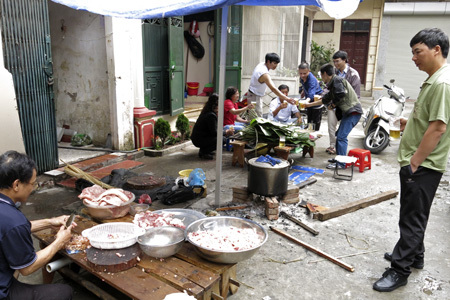 This year, Pham Van Mich's family, of An Duong Street, Hanoi, and three neighbours shared a pig they bought from a rural area.They use the meat to process different kinds of pork paste or Giò and make the cake. 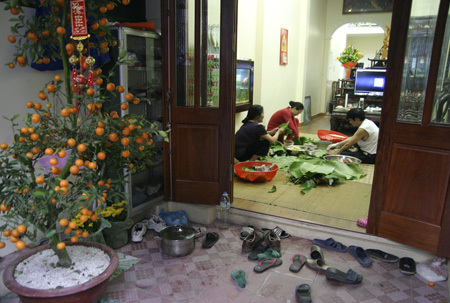 Making Chung cake an opportunity for neighbours to gather.